Most of the schools are still using the manual method of electing the student council officers. This process is actually a time consuming and error prone. The solution for the stated problems is to develop an automated system that is easy, accurate and consumes less time. 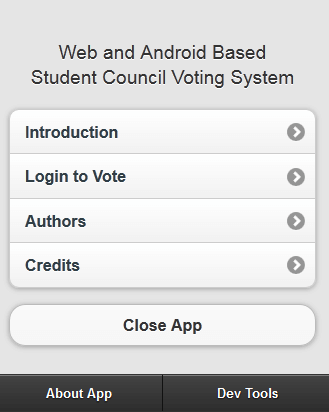 This project is an android based and online application system which will allows the students to vote via the internet or using their android phones. 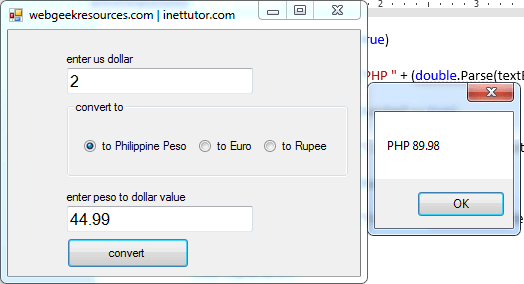 Create a program in C# that will ask the user to enter a value in dollar and the program has an option for the user to select whether to convert the dollar into peso, rupee or euro. 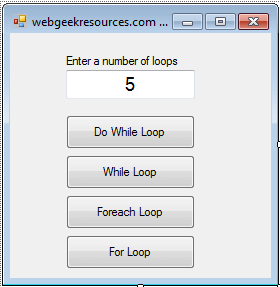 This tutorial in c# will demonstrate the four types of loop; do while loop, while loop, foreach loop and for loop. This is a gui program (graphical user interface) with windows form, buttons and other graphical controls. A button is the most common graphical control in any programming languages. It is a control the user can click to provide input to an application. In this simple tutorial, we will learn how to open a messagebox when a user clicks a button, change the text or caption of the button in runtime, disable the button (user cannot click or use the button) and hide or make the button invisible. 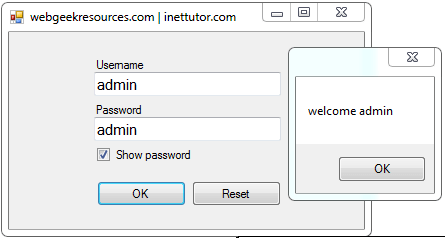 Create a program in visual basic .net that will let the user to enter a username and password then the program will check if the username and password combination matches to the criteria set by the program. Note: the program is no need for a database. We will create a login form that has no database, to do that we are going to use an if else statement and operator And. And operator is the logical as well as bitwise AND operator. If both the operands are true, then condition becomes true. This operator does not perform short-circuiting, i.e., it evaluates both the expressions. This tutorial in vb.net will show to us how to change password character in runtime or during the execution of the program. PasswordChar is a property of a textbox control that allows you to set what character are to be displayed in a textbox instead of the actual characters. 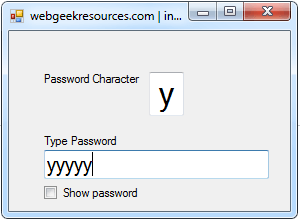 This is usually used in the password field where the actual characters being entered are not displayed or exposed. This is a sample program in vb.net that demonstrate checkbox control. A checkbox (in a graphical display) a small box that, when selected by the user, shows that a particular feature has been enabled or a particular option has been chosen or selected. Unlike radio buttons, checkbox control allows the user to select or check multiple values or answer in a given set of choices. Create a program in visual basic that will allow the user to upload rtf files in a database. The program will be able to compile those uploaded files and display it in a list format. 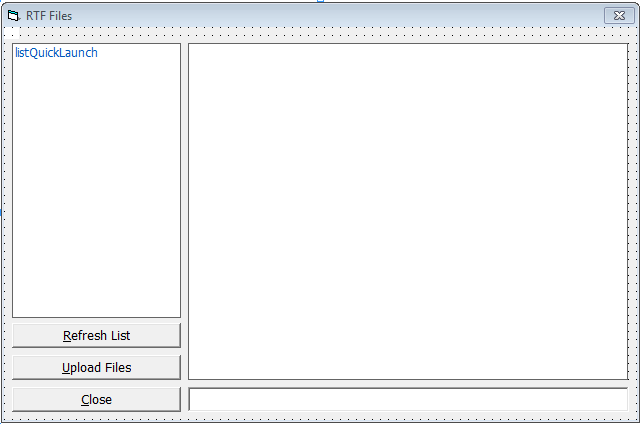 From the list of uploaded files, the user will be able to select a certain file, then the program will display the content of rtf file selected by the user. We will use vb6 and ms access as the database of the program. We will be using also listview control to provide the list of uploaded files on the database, for displaying the content of the rtf file we will include the RichTextBox control to our project. Commond dialog control is for browsing of rtf files. By the way RTF stands for Rich Text Format, it is a mix between rich text files and plaintext files. 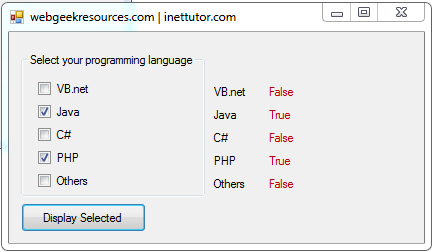 This tutorial will introduce to us what is a radio button control in vb.net together with a sample source code. What is a radio button? A radio button is a gui (graphical user interface) object or control that allows the user to only select one option from a given set of choices. 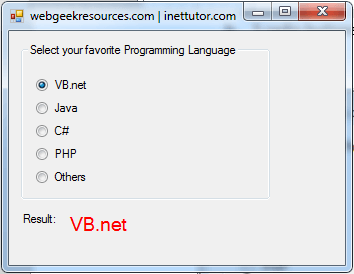 This is a simple program in vb.net that allows the user to select his or her favorite programming language in a given set of list in a form of radio button. The selected option will be automatically display in a textbox. 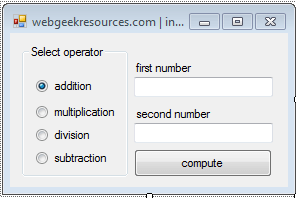 Create a gui (graphical user interface) program in c# that will allow the user to enter two numbers and choose what operation to use (addition, subtraction, division or multiplication), the program will then perform the operation selected by the user. 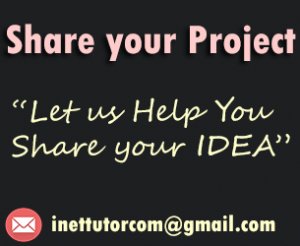 We will create a program that will allow the user what mathematical operator to use. Based on that selection the program will compute and display the result.